Imagine sitting in a hot tub in the Byron Bay hinterland, glass of wine in hand. This is just a taste of what life is like at Serenity Cottage. Nestled amongst the roses in the Byron Bay hinterland, Serenity Cottage sits on a magnificent 12-acre rural estate. The accommodation is rustically stylish, constructed of tin and timber. Built around 1890, the cottage was once the original diary farmer’s home. Age has added character to this cottage and even today, it is light and colourful, featuring timber floors throughout and exuding warmth. The cottage comes complete with a veggie patch, chook pen and a picket fence. The fruits of this garden including free range eggs and vegetables are served up to guests. Serenity Cottage is one of three properties owned and managed by host, Suzi. The comforts here are like home, offering guests the opportunity to simply relax with a book or get back to nature. Each room comes with swinging doors onto the verandah with views of estate and its gardens. The cottage is very quiet and private with two queen-sized bedrooms and a single room. Guests will find accommodation here superbly appointed for exclusive use with second to none facilities including a fully equipped kitchen, hot tub and BBQ. At mealtime, choose to dine inside or out. Good places to unwind can be found in the living areas and the verandah.For an upcoming winter getaway where you can curl up by the fire or walk around the estate, Serenity Cottage, located only 15 minutes from Byron Bay, has plenty to offer including great beaches. Owner Suzi has thought of everything to ensure guests enjoy a comfortable stay, right down to the mozzy nets. Serenity Cottage is located at Coolamon Scenic Drive in the Byron Bay Hinterland and is less than two hours drive from Brisbane. For bookings call 02 6687 2258. 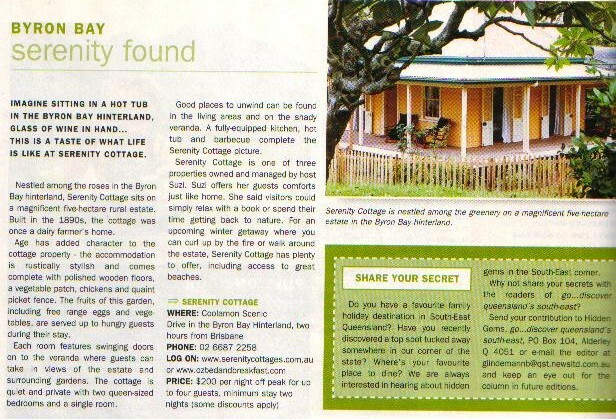 More detailed information on Serenity Cottage and other getaway escapes around the great south-east, can be found on www.ozbedandbreakfast.com – Australia’s largest bed and breakfast website directory.